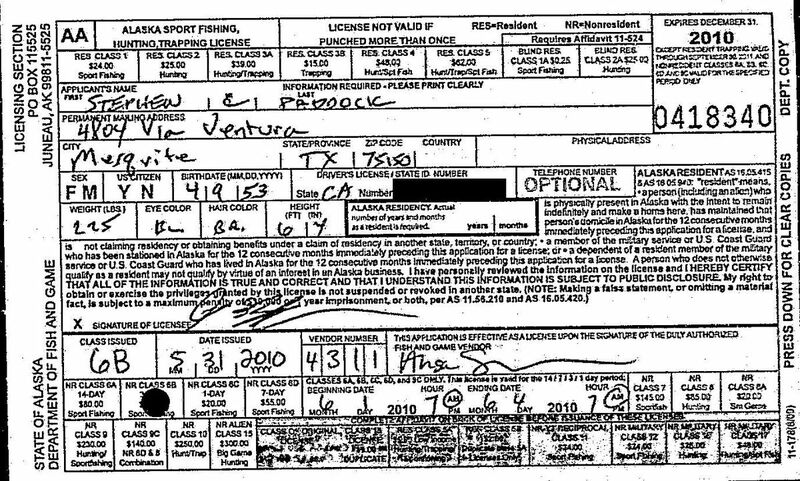 The state of Alaska issued nonresident sportfishing licenses in 2009 and 2010 to Stephen Paddock, who appears to be the man who authorities said killed at least 58 people Sunday in a mass shooting in Las Vegas. The three-day licenses were issued to Stephen C. Paddock, of Mesquite, Texas, said Ken Marsh, a spokesman for the Alaska Department of Fish and Game. Public records show that the 64-year-old Stephen C. Paddock named by authorities in the Las Vegas shooting also appeared to live in Mesquite, Texas, in 2010. The 2009 license was purchased at Salmon Falls Resort in Ketchikan, Marsh said. The 2010 license, he added, was purchased from Deep Blue Charters, which appears to be based in the community of Gustavus, near Glacier Bay. Some outlets reported Monday morning that Paddock had an Alaska hunting license, and a national database of public records showed that he'd been issued a "hunting and fishing" license in 2010. But Marsh said that the state of Alaska has not issued any hunting licenses to a Stephen C. Paddock.